The Gatton, Lockyer and Brisbane Valley Star is a community newspaper covering the rich Lockyer and Brisbane Valleys. It has enjoyed wide acceptance as the [HTML_REMOVED]local[HTML_REMOVED] paper in the area since 1956. Over the years ‘the Star’ has become the accepted voice for the local area. As a community newspaper the Star covers a variety of events, be it the induction of school captains (there are more than 50 schools in our coverage area), shows, festivals, council meetings, farming, local business, local industry through to the major issues concerning out region. The Star is a free and part paid weekly community newspaper averaging 56 pages and circulating to more than 19,000 homes or 35,000 readers from Withcott in the West to Walloon in the East, Toogoolawah in the North and Mt Sylvia in the South. As the leading local newspaper covering the Lockyer Valley Regional Council, Somerset Regional Council and the western townships of the Ipswich Council area, the Star is located in the heart of one of the richest and most fertile agricultural regions in Australia. 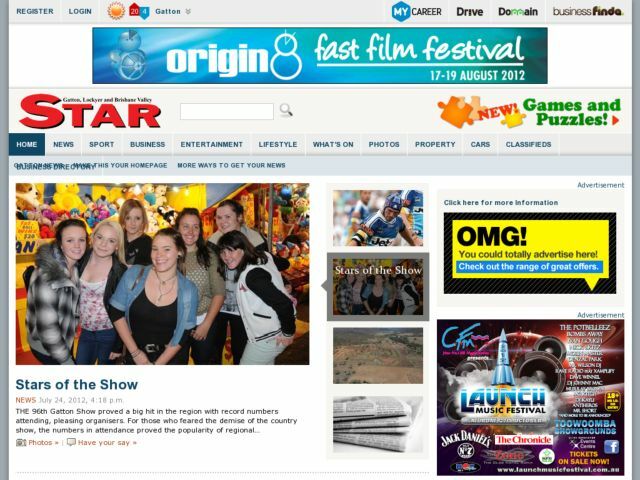 Read by 76 per cent of residents in its distribution area, the Star is undoubtedly the major source of news, sport, property, entertainment and retail information in Gatton and surrounding communities. The circulation of the paper covers the towns and districts of: Blacksoil, Blenheim, Coominya, Esk, Fernvale, Forest Hill, Gatton, Glamorgon Vale, Glenmore Grove, Grandchester, Grantham, Haigslea, Harlin, Hatton Vale, Helidon, Laidley, Lawes, Linville, Lowood, Marburg, Minden, Ma Ma Creek, Mulgowie, Murphy’s Creek, Plainland, Rosewood, Tarampa, Thagoona, Toogoolawah, Walloon and Withcott.